Plans to redevelop Bancroft Re c seem to have been discussed since at least 2007 (*see history at end). Over the past year the plans have been developed with a “Master Plan” agreed at the NHDC Cabinet in September 2012. It is intended to submit an application to the Heritage Lottery Fund to supplement monies already earmarked for this project. A survey to gather opinions not publicly canvassed since 2010 started in September, with a view to landscape architects being employed to draw up more detailed plans from October 2013. The contractors who will help finalize the plans for Bancroft are BDP and they are arranging to meet interested groups to discuss that in the next few weeks. The survey seems to have mostly been completed but results have not been published as yet, but NHDC publishes Bancroft related documents on their website. We were concerned at the report on Bancroft which was provided for the Hitchin Committee on November 12th (2013) – in para 3.3 – “As with many surveys of this type it is inevitable that the views expressed may not be wholly representative as a result of the largely self selecting sample and because of organised attempts to give prominence to a particular issue or set of issues.” This feels like a get-out-of-jail-free clause, we reserve the right to ignore views expressed on the survey which might come from any group that has a special interest in any part of the area. Pity if those with most experience or knowledge may be deemed out of court. How would a Council official decide on this? Whose views will be accepted – only those who totally agree with the Council’s “masterplan”? Hitchin Forum has taken a close look at NHDC’s plans for the redevelopment of Bancroft Rec. This follows the efforts last year by Hitchin Initiative who undertook to review the possibility of a replacement for Bancroft Hall, which is doomed by NHDC to be demolished when the Town Hall & District Museum opens. However HI were told a replacement was not possible and felt that they could do no more at present. We started to look at the whole area and, in talking to other users of Bancroft, felt that there were other concerns about the whole of the park that needed to be aired. Those conversations led to us convening a meeting for people who had made their concerns known. There have now been two meetings of the ‘Bancroft Users Group & Supporters’ (BUGS) which has tried to bring together those concerns and to contribute to the enterprise that we would like to support – a major improvement of the Rec. So far, BUGS has representatives from Hitchin Bowls Club, supporters of public (& easy access) tennis, hall users and Hitchin Forum.BUGS organized a public meeting on October 1st. Notes of that are available here Bancroft public meeting 1.10.13. There has been no other public meeting or meeting of any group focused on Bancroft Rec (or “Gardens” as NHDC has called it) since November 2010. We were particularly concerned that as the Council is looking for Heritage Lottery funding there should be more public discussions about the plans. We thought that the Pre-Application form which NHDC sent to the HLF overstated the community involvement and agreement to the ‘Master Plan’ which had been prepared by council officers and accepted by Council 12 months ago. In recent discussions with the Council we have been told that the term “Master Plan” should not be taken to mean that the proposals are set in stone and that current survey and the work of the landscape architects may lead to changes following a further public consultation. We hope so! The council has said that the 4 hard courts currently available for free (and easy access) public use will be removed. The idea is that this will create more green space for informal recreation. It is proposed that the ‘lower’ bowls green will be converted to a hard surface “multi user games area” (MUGA). This could either be designed with one part for soccer and basketball, and the other part as a normal tennis court (as in King George Playing Field), or be marked out to provide 2 tennis courts with mesh metal nets, or 2 soccer/basketball areas with the ‘nets’ then becoming fences between the two pitches (as in Baldock’s Avenue Park). The Council is due to renew the lease for the Tennis Club which has 3 well maintained and floodlit courts. It has said that there should be public access to these. 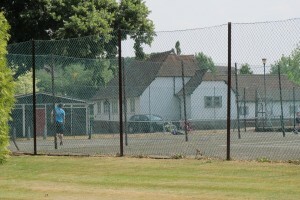 However the access is likely to be only when the club does not have its own activities and matches and will not be ‘easy access’ as is currently the case with the 4 public hard courts: booking would be by emailing the club which will then arrange for a club member to meet the prospective players at an appointed time to take the fee (£10 has been mentioned) and provide them with the code to be able to leave the court when they are finished. So easy access tennis courts will be reduced from 4 to 1 if the MUGA has a separate court. If there are combined courts and pitches there will be 2 courts if nobody is playing soccer, or none if soccer is being played. We support the provision of other sports, particularly for younger people, and the increase in the range of sports such as netball (and Hitchin houses the national association! ), if that is possible, but are mindful of the possible loss of tennis courts that this may entail. The Bowls Club are quite happy to lose one of their greens, but wonder about the possibility of a smaller pavilion overlooking the remaining green. They have a major concern about car parking. At present they mostly park in front of the pavilion. When the Council (with good reason) temporarily stopped this in the past, the club found that other clubs cancelled fixtures as alternative parking was too difficult. The nearby car parks were full, and carrying the bowls from far off car parks is not possible for many. The Master Plan excludes cars from their present area (in front of the Pavilion) and the proposal for a small car park between the current greens is impractical and would be hazardous to pedestrians. The Pavilion was built in 1929. It is underused and, since the Hall was built in the 1960s, has only been used by the Bowls Club. In the HLF Pre-App form the Council wrote that it aimed to bring it into “full community use”. We fully support that. The form also suggests that it can “potentially house a cafe and toilet” and mentions the possibility of it being extended. The business case for a cafe has not yet been researched and we do not know if that is viable. Toilets, however,are very important, particularly if families are to use the park more. We have been told that income from a cafe could possibly fund the upkeep of the toilets (maintenance costs were the reason for closing the old toilets some years ago). It seems that if an extension were to be built on the Pavilion, then its use for various functions, children’s parties, community groups etc, could also generate the income to pay for the toilets. As indicated in (2) above, the Bowls Club would like to have a smaller facility closer to the bowling green. The hall has been deemed to be outside of the scope of the redevelopment project. NHDC decided its future came within the realm of the District’s Community Hall Strategy, and it was surplus to requirement. Hall users have been told that they could be moved to the refurbished Town Hall or other community halls. This may suit some, but probably not all. Whilst the Town Hall managers will clearly want to accommodate such groups there is some uncertainty about how affordable and available the Town Hall will be. The access to the park, the availability of the kitchen (for a lunch club) and the storage space for equipment are all assets in the present hall. The Bridge Club (170 members, 50 turning up for each of their 3 regular weekday spots) will be most affected and they have campaigned most vigorously for a replacement. They have many resources which could be useful for any continuing indoor facility in that area and use it 12 months a year. They also provide a useful social and wellbeing function (mental and social activity which reduces depression and dementia etc). We feel concern that HLF funding depends on improved usage of the Rec, but closure of the Hall without replacement will substantially reduce footfall and use. Howard Park and Gardens in Letchworth offers a wonderful facility and it would be most desirable to have a similar water play feature. However Bancroft is a smaller site and does not have the nearby provision of a MUGA, several tennis courts and bowls greens that are found on Norton Common. The park should be available to the whole community and with a lot of flats being built in the near vicinity, the needs of local residents must be supported. Some improved play and water area would be welcome, but the right balance between open grassed areas and sports areas on a limited site, in the absence of some detailed research about current usage, is difficult. We hope that the survey currently being carried out by the charity ‘Groundwork’ will provide useful information for that. What were osier or willow beds and nurseries at the beginning of the 20th century, crossed by the ‘Gas Path’ to reach the old gas works at Starlings Bridge, was purchased in 1924 ( ‘Discovering Hitchin’, published by Hitchin Historical Society) and became Bancroft Recreation Ground by 1929 (date given by Reginald Hine in his History of Hitchin’, publ 1935). The pavilion was also built in that year. A pond was installed, whilst bowls and tennis were played. A benefactor gave money for the new hall in the 1960s – said to be in gratitude to the WRVS who provided a meals-on-wheels service from the small pavilion. Recent moves to upgrade the area came in 2006 when the Caldicott Centre was looking for new premises for a youth club. It seemed that they might replace the hall with a new building adjoining the disused toilets, with a multi user games area alongside, but funding was not found. The meetings of various interested organizations and people in 2007 were reminded by the Council that the underlying policy position was for the transfer of the management to the Caldicott Centre. The meetings became the ‘Friends of Bancroft Gardens’ and were expected to continue into 2008, but that did not happen. The next step was the District Council’s Green Spaces Management Strategy and Action Plan, both produced in 2009. 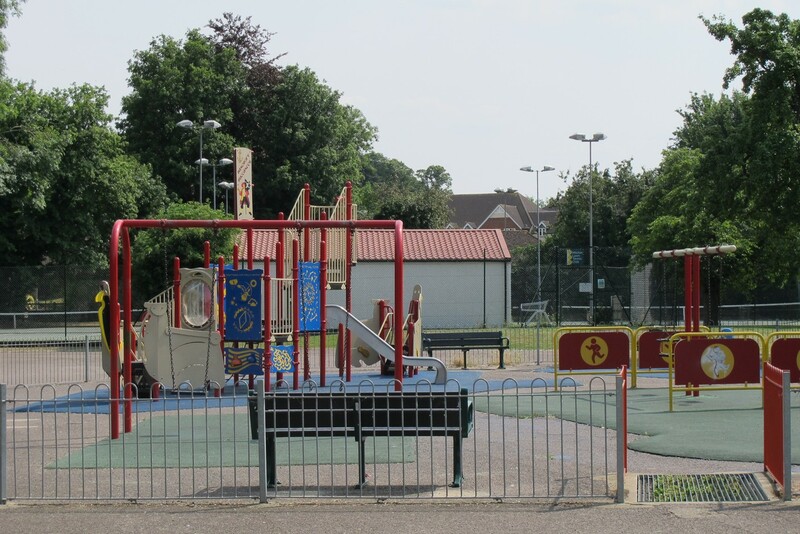 It seems that the renaming of the Recreation Ground was cemented at this time as the strategy stated that recreation grounds are on the edge of towns or in villages. Being near the centre Bancroft came under the category of ‘town parks and gardens’. Maybe seen as a minor quibble by some, but the historic name seems important, particularly when it is ‘heritage’ funds that are being sought. 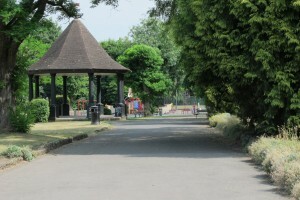 A change of name is also important in reflecting the character of a place – ‘recreation ground” indicating more ‘activity space’ than a ‘park and garden’. Two consultation meetings were held in 2010 to discuss the possible changes. By the end of that year the Council had decided that Bancroft Hall should be considered under the ‘Community Halls Strategy’, and thus not to be considered alongside the development of the rest of the rec. The Council then decided that the hall should be demolished and that the numbers calculated for floor space in the districts halls indicated that a replacement was unnecessary. Detailed work by the Bridge Club to challenge those figures has not been accepted by the Council, nor has the offer to manage a new hall and thus save the Council money. The consultation group was expected to be reconvened in 2011 but that did not happen. Copies of documents relating to Bancroft from 2009 are available on the Council’s website – click here.